Gold River Carpet Cleaning: Carter’s Carpet Restoration’s actual before & after. Whether you live in Rancho Cordova, Carmichael, or Gold River, your carpet probably is not in the same shape as this one was. Do you rent, lease, or own your home? 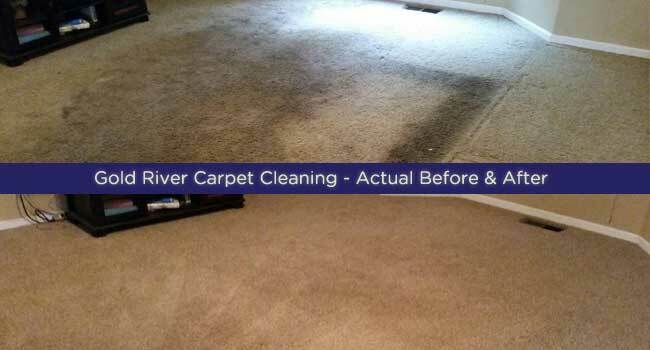 Regardless, you want your Gold River carpet cleaning service to remove as much soil as possible. What is most important when you hire a carpet cleaning provider? Cheap prices seem attractive, but quality work is what you expect. Should your technician be clean-cut & trustworthy, or just get the job done? How will you know? Locally-owned and family-run Carter’s Carpet Restoration offers Rancho Cordova, Gold River, and Carmichael high-end, top-quality carpet cleaning. Carter’s is your premiere professional floor care award winner, delivering top-notch carpet cleaning, pet odor removal, tile & stone cleaning, and now, wood floor care throughout Rancho Cordova, Gold River, and Carmichael! Call the carpet cleaning company more 95608, 95609, 95670, 95741, and 95742-area residents trust. You’ll experience a more deeply cleaned carpet, dry to the touch before your carpet cleaning tech leaves! Additionally, Carter’s employs only certified, background-screened, highly-trained, professional technicians. What good is a great technician without the best tools? Using the largest trucks available for Rancho Cordova, Carmichael, and Gold River carpet cleaning, powerful rotary extractors steam clean your floors more deeply than any van cleaner ever will. The combination of technology and quality-tested carpet cleaning products helps Carter’s achieve the best results possible, delivering award-winning Gold River carpet cleaning. Do your homework – check with the Rancho Cordova, Gold River, and Carmichael Better Business Bureau – Carter’s has been a member for nearly 20 years and has an A+ rating. Carter’s has a 14 day re-service policy, so in the unlikely case you’re not completely satisfied with your cleaning, Carter’s will return to your home and re-clean your carpet at no charge! That means you can trust Carter’s to provide the deepest, best Gold River carpet cleaning available. Hands down: Carter’s brings you the best Gold River carpet cleaning, providing the best service, most highly skilled technicians, and top-quality equipment! Tired of bait and switch companies? Carter’s offers FREE in-home estimates by qualified, professional technicians. 95608, 95609, 95670, 95741, and 95742-area residents in Rancho Cordova, Gold River, and Carmichael – call (916) 933-7807 today to schedule an appointment. You’ll be glad you did! Carpet Cleaning Gold River, actual before and after by Carter’s Carpet Restoration. Your carpet is probably not in the same shape as the one pictured above, but wouldn’t it be nice to know that as much soil as possible was being removed during your carpet cleaning, Gold River? What factors are important to you when hiring a service company? Are you searching for a cheap price or quality work? What about the individual coming to your home? Do you want him to be clean-cut and trustworthy, or just to get the job done? Carter’s Carpet Restoration, a locally owned and family run business, offers high-end, high-quality service to the entire carpet cleaning Gold River area. Carter’s is the professional carpet cleaning gold river company you can trust. You’ll experience a deeper cleaning and your carpet will be dry to the touch! Additionally, Carter’s employs highly trained, professional technicians. Premium equipment is another factor that gives you the best carpet cleaning Gold River! Carter’s uses the largest trucks made for carpet cleaning and powerful rotary extractors to steam clean your floors. The combination of technology and quality-tested carpet cleaning products helps Carter’s achieve the best results possible when giving you carpet cleaning Gold River. And Carter’s has a 14 day re-service policy. If you’re not satisfied with your cleaning, Carter’s will return to your home and re-clean your carpet at no charge! Do your homework – check with the local Better Business Bureau – Carter’s has been a member for over 15 years and has an A+ rating. What that means is Carter’s is the trusted company providing the deepest available carpet cleaning, Gold River. Tired of bait and switch companies? Carter’s offers FREE in-home estimates. Just call today to schedule an appointment and a qualified, professional technician will provide you with an estimate. Call now – you’ll be glad you did: (916) 933-7807.